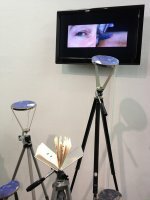 Monica Ross (1950-2013) was a British artist working with video, drawing, installation, text and performance. She first came to prominence as a feminist artist and organiser and was co-responsible for collective initiatives such as the seminal women's postal art event (Feministo: Representations of the Artist as Housewife, 1977) and touring project Fenix. In 1980, Ross co-established the Sister Seven group, a network for the distribution of poster art and performances which took place in church halls, libraries, on the streets and at peace camps including Greenham Common. Ross continued to instigate collective work with women's affinity groups, which led her to work with the medium of performance. From 1985, Ross was senior lecturer on the Fine Art and Critical Studies BA at St Martin's School of Art. Her own practice was concerned with issues of memory, time and the archaeology of the present and she considered expanded contexts for performance and its dissemination. In 2005, she presented the first version of what has become Anniversary – an act of memory, a recitation of the Universal Declaration of Human Rights from memory. The work was performed at 60 venues in the UK and abroad and concluded with the final performance taking place at the Human Rights Council of United Nations in Geneva on 14 June 2013, the day Monica Ross died in Brighton. Late in 2014, England & Co held the exhibition Monica Ross: valentine. In November-December 2016, the exhibition Monica Ross: A Critical Fine Art Practice took place at Chelsea Space. A monograph about the artist, Monica Ross: Ethical Actions, A Critical Fine Art Practice has recently been published by Sternberg Press. 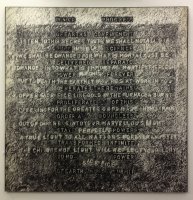 Mixed media on canvas, combining texts from William Blake and the Bible.